Last weekend we set up a table at Arbor Day at our state Arboretum and Botanical Gardens. Although it was very chilly and rainy out, there was a good turn out and got to talk to a lot of people and other vendors. Our display booth focused on native bees and showcased a native bee home, which anyone can make themselves! Many people wanted to know if I had more information on creating these homes, so I thought a blog post would help. Pollinators, they pollinate our food! Our pollinators are important, especially when it comes to helping us have food. They pollinate our food and flowers for us and if we didn’t have them, we wouldn’t be here. Many farmers depend on specific types of bees to pollinate their fields, which include the non-native honey bee, as well as our native bees. All pollinators need as much help as they can get right now. Just this year bee species have been put on the endangered species list. 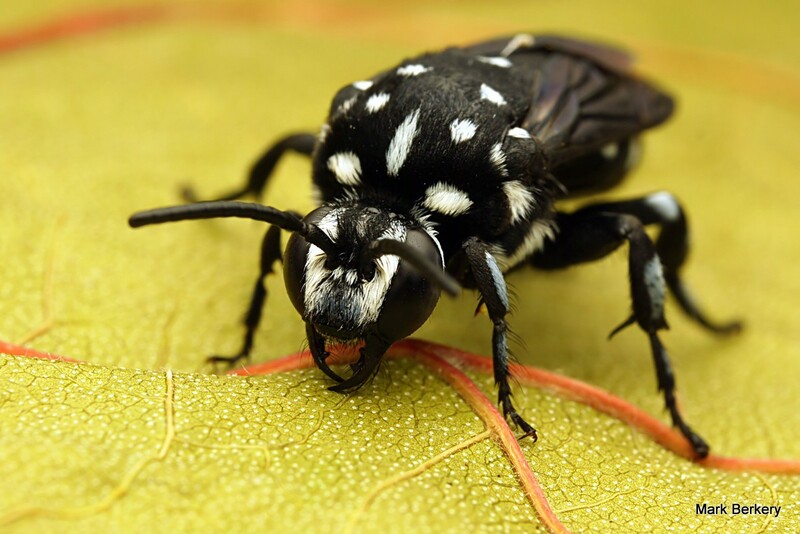 Native bees are solitary, meaning they like to live, work, and raise young alone. Honey bees aren’t native to the U.S. and live in a complex social structure within their hive. They are native to Europe and were brought here in settlement times. There are five main genus’ of bees in the U.S. Apidae is the largest, which is were we got the term ‘apiary’ from. The four others are Andrenidae, Colletidae, Halictidae, and Megachilidae. Apidae includes Bumble Bees who do live in very small groups, but are mostly solitary. Apidae also includes Carpenter Bees, Squash Bees, the Southeastern Blueberry Bee, and the Cuckoo Bee. 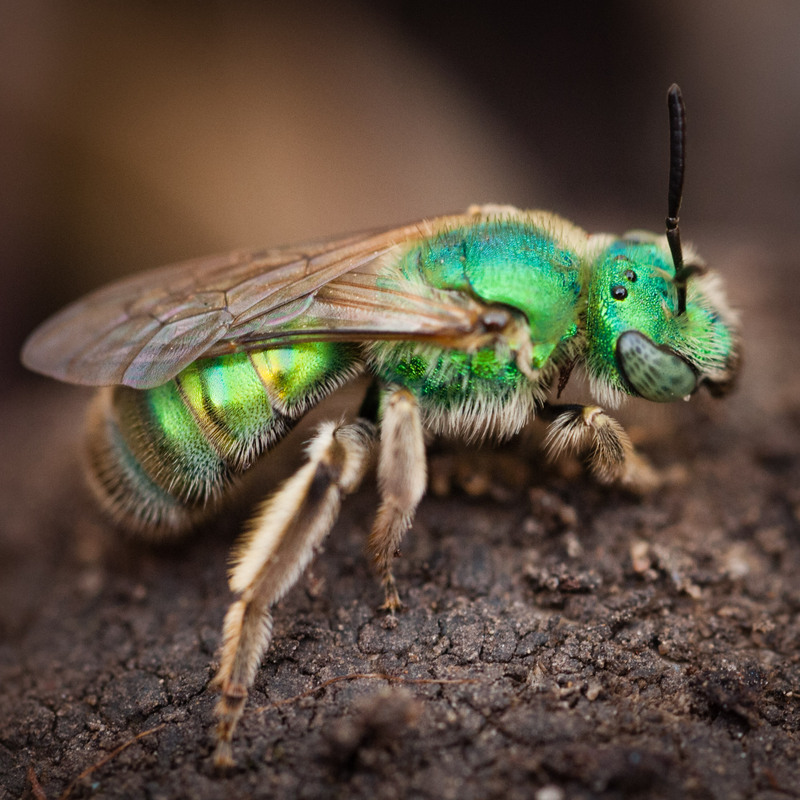 Halictidae includes Sweat Bees which are often metallic blue and green. 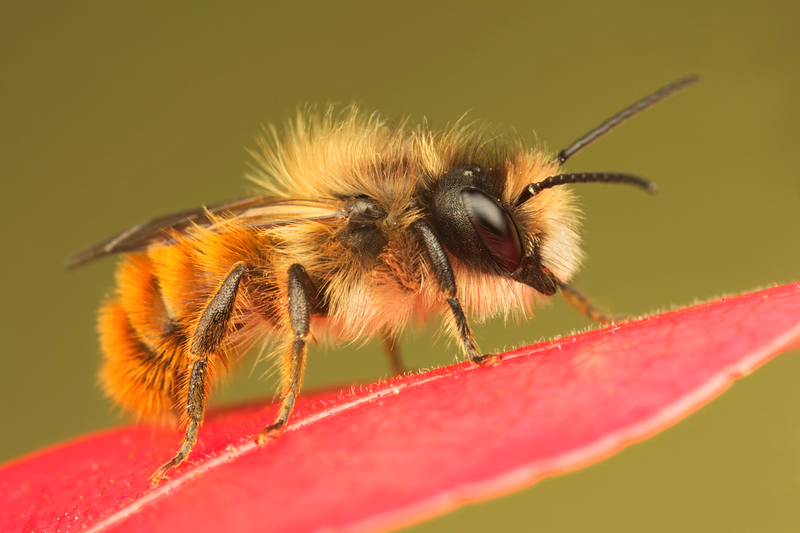 Megachiliadae includes the Leafcutter Bee, Blue Orchard Bee, and the Mason Bee. Andrenidae are Minor Bees, and Colletidae is the Yellow Masked Bee. Native bees are also friendlier than honey bees since they don’t have a hive to protect each other, and they are just too busy working to bother. The only bees I’ve had sting me rarely are sweat bees. Carpenter or bumble bees will often try to run you away from their nest. But most of the time if you leave them ‘bee’, they’ll leave you be too! You can learn more about different species of bees on the Beautiful Bees website. What Is a Bee Home? Bee homes for native bees are different than a hive which honey bees like to live. A native bee home consists of small holes, such as hollow plant tubes or holes drilled into wood. 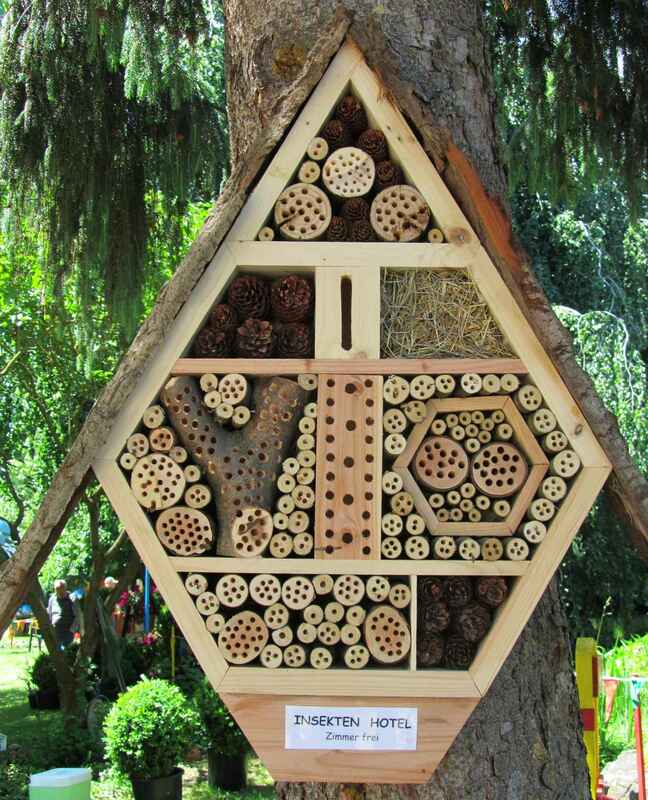 A bee home can consist of different materials and different sized holes to attract different species of native bees. These homes are very popular in Europe and some of them are really creative! 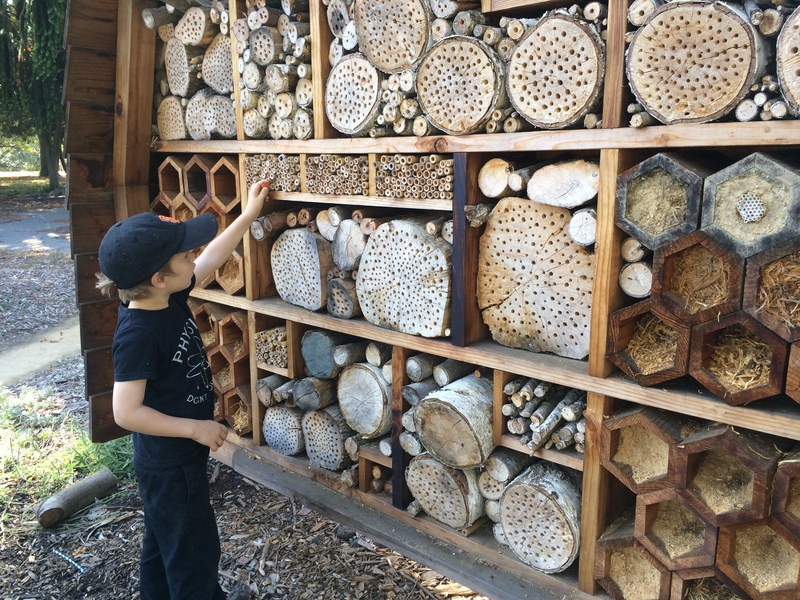 These native bee homes are replicating their natural homes. Most of the time people remove their dried perennial and annual stalks in the fall. 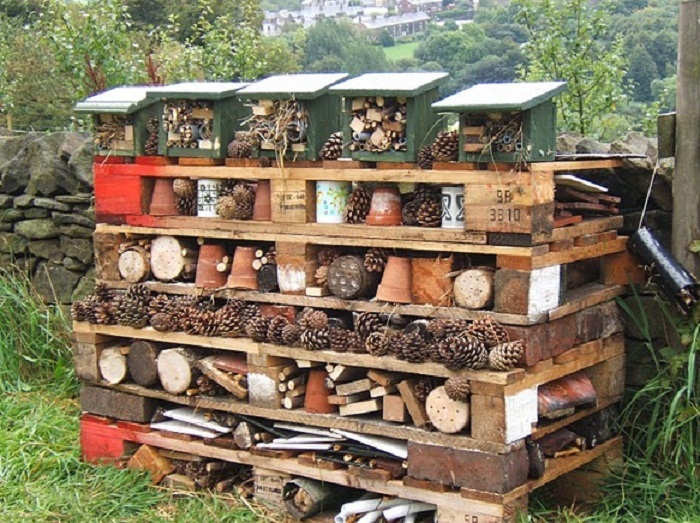 This is actually taking away where our pollinators need to live over winter! Pollinators will find ways to get into the stalks and this is where they live in the winter. It’s always best to leave the stems as long as you can until April 1st here in Kentucky. If it cannot be done, you can use the stalks to make a home like these. At least place the dried stalks in a hidden area until spring. They can be made of any size. There are a few requirements though! 1. Location: The home must be placed in a dry location. Bees can tolerate cold, but not wet! The home can be placed in a protected area and/or have a roof. The best location would also receive morning sun and some shade in the day so it doesn’t get too hot during the heat of the summer. 2. Size: Sizes of the holes should range in diameter from 3/32″ to 3/8″. If you purchase cane tubes online, be sure they are of this size, some aren’t! The tubes should range about 6″-8″ in length and be smooth on the ends. 3. Materials: You can use any of last year’s hollow flower stems that range in these sizes length and diameter wise. I used Joe Pye stalks which are perfect. Also, hosta or sedum stems could work. You can also drill holes into pieces of natural wood. Do not use non-natural materials like straws, they will form condensation on the inside and will likely kill the baby bees. If you want to attract other insects, you can use other materials such as pinecones, pine needles layers of bark, or a clump of dried grasses. If using lumber, make sure it has not been treated with chemicals. 4. You will know the homes will be used if you see a little plug of dirt on the ends. This is when the bee closes up the hole to ensure the eggs inside stay dry and protected. These can be replaced every couple of years. 5. It’s an experiment! See what materials are being used the most. Try different locations. See if your edible garden does better with a native bee home nearby. The bees use the hollow tubes to lay their eggs inside. They will make chambers inside and each baby bee gets its own chamber. The mama bee divides each chamber with mud. There will be as many chambers as the hollow tube will hold, maybe around 6 or 7. She will lay around 20 larvae in her lifetime. She deposits a high energy pollen mixture inside each chamber. When the egg hatches, the larvae eats the pollen and becomes a big larvae. This happens over a time period of spring to summer. In the fall, the baby bee larvae will turn into an adult bee and make a cocoon, where he/she will hibernate over winter, and then will emerge next spring. A bee on average only lives 6 weeks once it has come out into the world. Native plant nectar and pollen is much more beneficial to our pollinators because they are much more nutritious than exotic plants. It is like the difference between eating Doritos and an apple! Choose plants from local independent nurseries and make sure to ask that they haven’t been tainted with systemic pesticides that last in the plant for years. These pesticides are extremely devastating to the population. Any pollinator that visits it will die. Stop pesticide which includes chemical applications, lawn sprays, and mosquito spraying. All of these chemicals target all insects, not just the insect you are going after. These are amazing!! 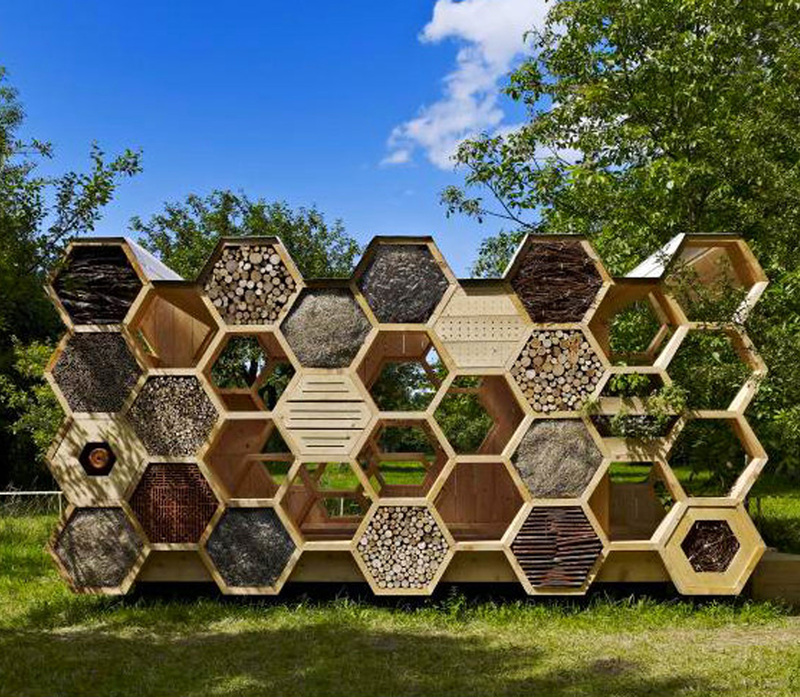 They look like works of art but are serving a wonderful purpose providing homes for different species of native bees. I think people forget about them sometimes and focus only on honeybees, but these guys are important too! Thank you so much Kerry! I agree, I think people don’t realize how many other bees there are! One tip I would like to add is, if there are ants coming out of the entrance of your hive there could be a problem. Ants don’t generally affect strong hives but can indicate that something else is dead in the hive and they cleaning up the left overs. So try putting cinnamon around the base of the hive first and reapply it if it rains. This will drive away the ants.